Mexican cuisine has several parallels to our Indian food. For instance, black beans is quite common there as is Rajma in India. So, it’s not surprising if their fried rice tastes very similar to ours, sans a few ingredient changes here and there. That’s how I look at this recipe of Mexican Chilli Rice. Like us, the Mexicans don’t shy away from spice, the real thing. In fact, the very name of the dish should be conveying this message. Being a land of so many (nearly 150) chilli varieties, this shouldn’t be a surprising fact. However, unlike the rest of the world, that used chillies for heat, this nation, dubbed as the “Mother of Chillies”, uses it more as a flavouring agent. Maybe this is also the only place where you will see people referring to a chilli flavour for its sweetness. Coming back to our recipe that’s inspired by the American Chilli Nation, this mixed vegetable rice a.k.a. 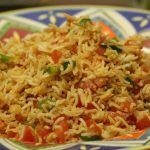 Mexican Chilli Rice is quite spicy and lightly saucy from the use of tomato sauce, which is not something that we use for our Indian version. It’s not Mexican until it has some beans in it. However, the version I made here, does not have beans or rajma as I had ran out of stock. Feel free to add your rajma to make this all the more interesting. However, do remember, the Rajma needs to be soaked for a good 12-15 hours and cooked well to get it soft. If you like this dish, check out some of our other Mexican delicacies and hot stuff! 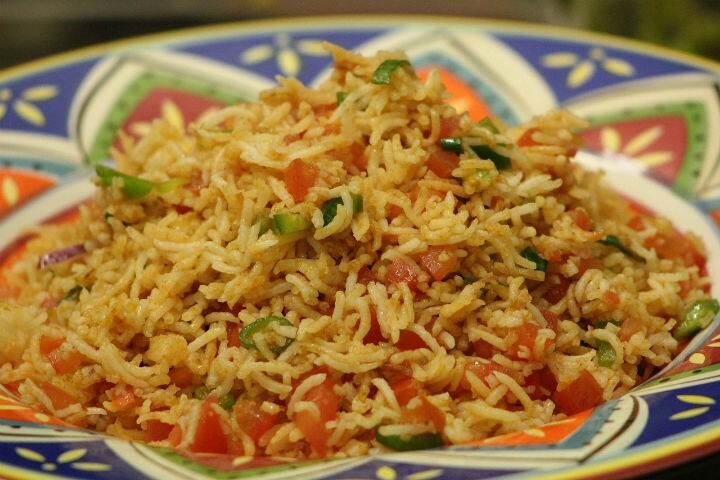 Spicy vegetable rice made the Mexican way. Blend the red chillies in a mixer and grind them to a coarse paste. Heat a pan under medium flame, add some oil and fry the onions until transparent. Add the garlic and saute. Add the sliced carrot and cook until soft. Add the cabbage. capsicum, salt, ground red chilli flakes, and little red chilli powder. Now Add the cooked rice and mix gently until the sauce is coated well to the rice. Sprinkle the coriander leaves and squeeze the lemon juice and give it a mix. Serve hot. Feel free to comment or share your thoughts on this Mexician Chilli Rice Recipe from Awesome Cuisine.